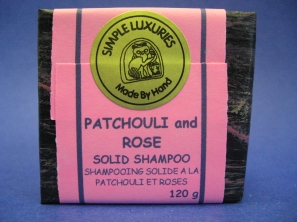 The rich creamy lather from this wholesome bar cleans thin or dry hair gently and thoroughly. 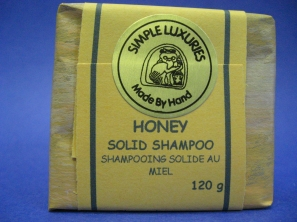 Honey and oats plump up each hair shaft for body without sticky residues. Jojoba oil feeds and conditions both scalp and hair. With glycerine formed in the natural soap making process, it contributes to shiny, really healthy hair. Wholesome milk helps maintain the proper pH balance and olive and sweet almond oils make an exceptionally mild cleanser. 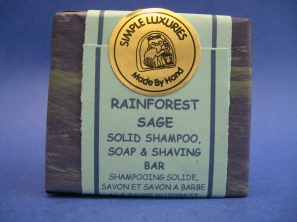 Coconut and castor oils produce the rich lather and make the bar hard and long lasting. Luxurious lather gently and thoroughly cleans normal or damaged hair. 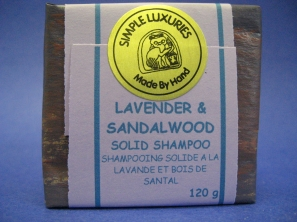 Essential oils of lavender and sandalwood, along with jojoba oil feed and condition both scalp and hair. Glycerine formed in the natural soap making process contributes to shiny, really healthy hair. Wholesome milk helps maintain the proper pH balance and olive and sweet almond oils make for an exceptionally mild cleanser. Coconut and castor oil produce the rich lather and make the bar hard and long lasting. Fabulously sensuous patchouli and rose oils provide special treatment for overworked, dry and brittle hair, restoring its natural bounce, shine and body. On a base of food grade vegetable oils, this solid shampoo bar is made with olive oil for mildness and just enough coconut and castor oils to give it a rich cleansing lather without stripping away the hairs natural healthful oils. Wholesome milk balances the pH and the natural soap making process contributes lots of moisturizing glycerine. Sweet almond oil provides yet another dimension of gentle hair care. With stimulating essential oils of sage and mint, this dynamic bar produces a rich dense lather perfect for bathing, shaving and shampooing. Made with olive and sweet almond oils, it is exceptionally mild. The glycerine retained from the natural soap making process soothes and prevents dryness. Wholesome milk helps maintain a healthy pH balance. Coconut and castor oils make the thick, rich lather that rinses out cleanly, and palm oil makes the bar hard and long lasting.